Bivalve (2 shells); shell triangular, tiny, inflated, anterior end rounded, posterior end more angulate; color white or off-white; radial ridge from beak to ventral edge of shell on posterior end; fine concentric growth rings; beaks in center of shell; hinge has a spooned-out depression (chondrophore) for the inner ligament attachment. May resemble juvenile southern surf clam (Spisula raveneli). Differs by having a stronger posterior ridge and more angular posterior end. 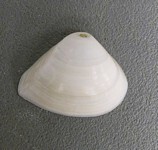 The southern surf clam is usually more brownish in color.